Background: The ankle joint is capable of flexion and extension, including plantar flexion and dorsiflexion, which enables it to act as a lever and a support, and to transmit movement. Ankle joint function is seriously threatened by ankle injury, which is often accompanied by fracture and ligament injury. Previously, diagnosis of ankle injury mainly relied on clinical signs and radiographic examination. However, radiographic examination is insufficient for ankle injury diagnosis, as it cannot clearly diagnose damage to the surrounding ligaments, tendons and other soft tissues. Multisequence and multiplanar MRI is currently the optimal noninvasive method for high-resolution determination of soft tissue deformations, but little has been reported on the diagnostic accuracy of MRI for ankle ligament and tendon injury. 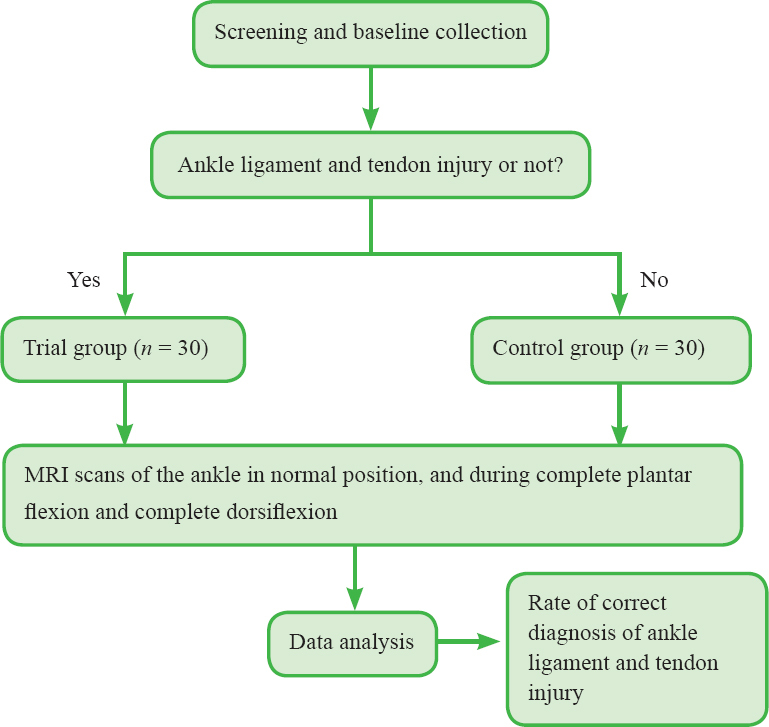 Here, we describe our protocol to evaluate the diagnostic value of MRI for ligament and tendon injury of the ankle in its normal position, and during complete plantar flexion and dorsiflexion. Methods/Design: This is a single-center, prospective, diagnostic trial that will be completed at the First Affiliated Hospital of Hebei Medical University, China. Sixty cases have been recruited, including 30 normal ankle joint cases and 30 cases of ankle ligament and tendon injury. All cases underwent MRI with the ankle joint in normal position, complete plantar flexion and complete dorsiflexion, and the multiposition MRI results were compared. The primary outcome measure is the sensitivity of MRI to detect ligament and tendon injury of the ankle during complete plantar flexion. The secondary outcomes include the specificity, positive and negative predictive values, and positive and negative likelihood ratios of MRI for diagnosis of ligament and tendon injury of the ankle in the complete plantar position as well as the rate of correct diagnosis; specificity and sensitivity, positive and negative predictive values, and positive and negative likelihood ratios in normal ankle position or in the complete dorsiflexion position as well as the rate of correct diagnosis; morphology of the ankle on multiposition MRI. Discussion: This study aims to determine the rate of correct diagnosis of ankle ligament and tendon injury using MRI, to clarify the diagnostic value of MRI for ankle ligament and tendon injury, and provide a quantitative MRI diagnostic standard for developing a reasonable surgical strategy. Trial registration: ClinicalTrials.gov identifier: NCT03049423. Ethics: The study protocol was approved by the Ethics Committee of the First Affiliated Hospital of Hebei Medical University in China (approval No. 2015076), and performed in accordance with the guidelines of the Declaration of Helsinki, formulated by the World Medical Association. Informed consent: Written informed consent was obtained from all participants prior to the trial. The ankle joint is an important part of the human lower limb. It functions to maintain the normal standing position, to support and bear the bodyweight, and to conduct movement (Xue et al., 2016). As a complex joint, the ligaments and tendons surrounding the ankle play an important protective effect, and also play a fixed role in the movement of the ankle to effectively prevent excessive ankle varus/valgus (Yang, 2011; Sofka, 2017). Ankle fractures account for approximately 3.9% of total body fractures, and are the most common intra-articular fracture type (Pakarinen et al., 2011). Ankle injury is often accompanied by intra-articular fracture and surrounding ligament rupture (Crim, 2017). With the increasing requirements for joint function and clinical surgery, inappropriate treatment of ankle ligament injury can result in limited movement of the ankle, traumatic arthritis, and chronic ankle instability (Jolman et al., 2017). Diagnosis of ankle injury is routinely performed using radiography, which can accurately diagnose ankle dislocation and fracture (Meehan et al., 2017). However, plain radiography has low resolution for tendon and ligament lesions, and can lead to missed diagnosis of mild fractures, bone contusion and occult fractures; moreover, it is difficult to fully determine the location, type and degree of ankle injury (Hua, 2012; Szczepaniak et al., 2015). MRI has high definition and resolution, and enables the implementation of multiparameter, multidirectional scanning. MRI histopathological findings can accurately and objectively display injuries of the ankle and surrounding ligaments and their severity. MRI can display the anatomic structure and severity of ligamentous injury of the ankle region in three anatomic planes: transverse, sagittal and coronal. Sagittal MRI is good for diagnosis of Achilles tendon lesions, as it can clearly show the talus, posterior tibial tendon, talocalcaneal joint, Achilles tendon, subtalar joint, articulatio talonavicularis, tibiotalar joint, and the cartilage and joint cavities. Coronal MRI can clearly show the structures of the peroneal joint, tibiotalar joint, and lateral malleolus, especially the articular surfaces between the tibia, fibula and ankle bone and between the ligament, fibula and ankle bone; furthermore, it can display the posterior tibial ligament, posterior talofibular ligament and posterior tibial tendon. Transverse MRI shows the tibiofibular ligament and the anterior talofibular ligament (Long et al., 2012; Liu et al., 2013). The ankle ligament mainly consists of three parts: lateral collateral ligament, medial collateral ligament and tibiofibular ligament. Activities of the ankle include flexion and extension along the sagittal plane, including plantar flexion and dorsiflexion; this movement enables the ankle to play a role in supporting and bearing weight, to conduct movement, and to function as a lever. Considering the complex anatomy of the ankle joint, it is unclear whether the MRI signs of ligament and tendon injury vary in different planes and in different ankle positions. Currently, ankle ligament injury is mainly detected through clinical signs and MRI examination, and a large amount of clinical research has focused on the diagnostic value of MRI for ankle ligament injury and postoperative rehabilitation evaluation; however, little has been reported on MRI findings of the ankle in different positions. Therefore, in this study, we will compare the results of multiposition MRI scans of the ankle ligaments and tendons to clarify the best method to obtain imaging data of different ankle ligaments and define the severity of injuries to calculate the rate of correct diagnosis, thereby enabling the development of a reasonable surgical strategy in clinical practice. A single-center, prospective, diagnostic trial. The First Affiliated Hospital of Hebei Medical University, Hebei Province, China. The aim of this study is to compare multiposition MRI findings of the ankle ligaments and tendons. Inpatients at the First Affiliated Hospital of Hebei Medical University in China were screened through physical examination and specialist examination, and 30 patients with normal ankle joints and 30 patients with ankle ligament and tendon injury were selected in accordance with the diagnostic criteria of ankle ligament and tendon injury (Appendix 1). Baseline data were collected and recorded. Each participant was required to undergo MRI scans in normal position and during complete plantar flexion and complete dorsiflexion ([Figure 1]). Multiposition MRI findings were compared to calculate the rate of correct diagnosis of ankle ligament and tendon injury. In accordance with our experience, we hypothesized that MRI scanning for diagnosis of ankle ligament and tendon injury could achieve a sensitivity of 85% and a specificity of 75%. Taking α = 0.05 (two-sided), б = 0.1, and μ0.05 = 1.96, the required sample size was calculated to be n = 49 in the trial group and n = 72 in the control group using the formula [μα2 × p × (1-p)]/ б2, where p refers to sensitivity or specificity. Allowing for a 20% drop-out rate, we planned to enroll 146 cases, including 59 in the trial group and 87 in the control group. In accordance with the inclusion and exclusion criteria, only 60 cases (n = 30 per group) were actually enrolled in this trial. Sixty participants from the First Affiliated Hospital of Hebei Medical University were recruited through newspapers, public communication, and hospital and public institution websites. A public lecture on ankle injury was conducted at our social work center, in order to inform more people of the reason for the trial and obtain volunteer participants. All participants provided written, informed consent prior to trial commencement. The baseline information including demographic data and general disease history of the included patients is shown in [Table 1]. In this study, the tibiofibular ligament, lateral collateral ligament and medial collateral ligament of the ankle were detected on MRI imagery. The tibiofibular ligament includes the anterior tibiofibular ligament, posterior tibiofibular ligament, transverse tibiofibular ligament and interosseous ligament. The lateral collateral ligament includes the anterior talofibular ligament, posterior talofibular ligament, and calcaneofibular ligament. The medial collateral ligament includes the anterior tibiotalar ligament, posterior tibiotalar ligament, and calcaneotibial ligament. All participants underwent transverse and coronal MRI scans of the ankle in its normal position and during complete plantar flexion and complete dorsiflexion. In this study, MRI signs of ankle ligament and tendon injury were graded from 1-3 ([Table 2]). The sensitivity of MRI for detecting ligament and tendon injury of the ankle during complete plantar flexion: The sensitivity (true positive rate) is defined as the percentage of actual patients who are correctly diagnosed with a disease. A higher sensitivity indicates a higher rate of correct diagnosis. 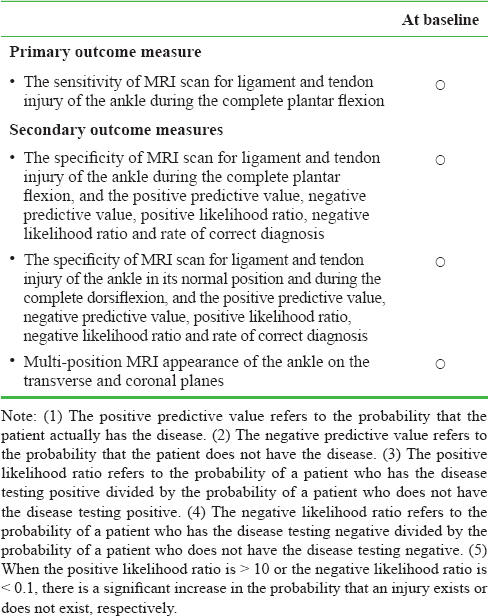 The specificity of MRI for ligament and tendon injury of the ankle during complete plantar flexion, and the positive predictive value, negative predictive value, positive likelihood ratio, negative likelihood ratio for the diagnosis of ankle ligament and tendon injury and rate of correct diagnosis: The specificity (true negative rate) is defined as the percentage of disease-free patients who are correctly diagnosed with no disease. A higher specificity indicates a higher rate of correct diagnosis. The rate of correct diagnosis is calculated according to the following formula: [(the number of actual patients who are correctly diagnosed with a disease + the number of disease-free patients who are correctly diagnosed with no disease)/total number of patients]×100%. The sensitivity and specificity of MRI for ligament and tendon injury of the ankle in its normal position and during complete dorsiflexion, as well as the positive predictive value, negative predictive value, positive likelihood ratio, negative likelihood ratio and rate of correct diagnosis. Appearance of the ankle in three different positions on transverse and coronal MRI to determine the severity of ankle ligament and tendon injury. The schedule of the trial procedure is shown in [Table 3]. If expected or unexpected adverse events (such as headache and nausea) occur during the MRI scanning, the date of occurrence, type of injury and therapeutic managements will be recorded. Severe adverse events, including a requirement for immediate surgery, damage to the patient's ability to work, life-threatening events or death will be reported to the project manager and the institutional review board within 24 hours. All data will be collected on a case report form, recorded electronically, and saved in a dedicated computer. Continuous variables from each record will be collected for descriptive statistical analysis, to allow real-time review and identify any potential deviation. The validity of the data will be assessed by the censor once every 6 months through a random sampling of 10% of the database. Only the researchers participating in the study will have the right to query the database, which will not be modified. Statistical analysis will be completed by professional statisticians, who will produce a statistical report. The statistical results will be given to the project manager, who will be responsible for writing the research report. Anonymized trial data will be available at www.figshare.com . The statistical analysis will be completed using SPSS 19.0 statistical software (IBM Corp., Armonk, NY, USA) in line with the intention-to-treat principle. Measurement data will be expressed as a percentage. The Pearson χ2 test will be used to compare the sensitivity and specificity of detection of ankle ligament injury in the three positions, as well as the positive and negative predictive values, positive and negative likelihood ratios, and rate of correct diagnosis. Multiple comparisons of different samples in the same group will be performed using the χ2 segmentation method. Intergroup comparison will be tested using a fourfold table or the Fisher exact test. Receiver operating characteristic (ROC) curves will be created, and the optimal cut-off point will be selected as the diagnostic reference value. The ROC curve that is closer to the upper left corner indicates greater accuracy of the diagnosis. The area under the ROC curve is taken as a measure of diagnostic accuracy. A value of P < 0.05 will be considered statistically significant. The trial was initiated in July 2015, and ongoing data analysis is expected to be completed in May 2017. The ankle joint is mainly formed by the tibia, fibula and talus, which are covered with muscles and ligaments to play a fixed role. When a lesion occurs in the ankle joint, rational use of technical parameters helps doctors to make a comprehensive judgment on the injury. In this study, multidirectional MRI scans, such as transverse and coronal scanning, have been employed to assess the severity of ligament injury of the ankle in different positions. It is important to determine the optimal ankle position and scanning method for MRI diagnosis of ankle ligament injury. We have attempted to compare the multipositional MRI findings of the ankle ligaments and tendons in individual patients, and to observe the rate at which MRI enables correct diagnosis of ankle ligament and tendon injury. The study aims to accurately understand ligament and tendon injury of the ankle, thereby providing imaging evidence for the accurate diagnosis of ankle ligament and tendon injury. However, limitations created by the small sample size and the lack of blinding will affect the accuracy of our study. (1) There exists post-traumatic local tenderness, worsening of ligament or tendon pain under stress, and excessive range of motion of the ankle joint (positive anterior drawer test and talus tilt test). (2) According to the Lauge-Hansen classification of the ankle joint, the postrotation external rotation injury is regarded as I, II, and IV; prerotation pronation injury as I and II; postrotation adduction injury as I. (3) Degree I ligament injury: Presence of clinical signs including swelling of the lateral malleolus and pain; ankle varus with the talus tilted at < 15° on anteroposterior radiography of the ankle. (4) Degree II and III ligament injury: Swelling of the lateral malleolus and pain accompanied by loosening of the ankle joint; positive anterior drawer test and talus tilt test; ankle varus with the talus tilted at > 15° on anteroposterior radiography of the ankle. Crim J (2017) Medial-sided ankle pain: deltoid ligament and beyond. Magn Reson Imaging Clin N Am doi: 10.1016/j.mric. 2016.08.003. Hua Y (2012) Application of three-dimensional reconstruction of spiral CT in the classification and treatment of ankle joint fracture. Zhongguo Wuzhenxue Zazhi 12:1078-1079. Jolman S, Robbins J, Lewis L, Wilkes M, Ryan P (2017) Comparison of magnetic resonance imaging and stress radiographs in the evaluation of chronic lateral ankle instability. Foot Ankle Int doi: 10.1177/1071100716685526. Liu XQ, Hu XH (2013) Clinical study of ankle joint mri0 examination. Yixue Linchuang Zazhi 34:77-78. Long W, Ge B,Fan P, Tan S, Zeng L, Zhao ZY (2012) Low field MRI in the diagnosis of ankle joint fracture ligament injury. Guizhou Yiyao Zazhi 36:1012-1015. Meehan TM, Martinez-Salazar EL, Torriani M (2017) Aftermath of ankle inversion injuries: spectrum of mr imaging findings. Magn Reson Imaging Clin N Am doi: 10.1016/j.mric.2016.08.012. Pakarinen HJ, Flinkkil TE, Ohtonen PP, Ristiniemi JY (2011) Stability criteria for nonoperative ankle fracture management. Foot Ankle Int 32:141-147. Sofka CM (2017) Technical considerations: best practices for mr 0 imaging of the foot and ankle. Magn Reson Imaging Clin N Am doi: 10.1016/j.mric.2016.08.001. Szczepaniak J, Ciszkowska-Łysoń B, Śmigielski R, Zdanowicz U (2015) Value of ultrasonography in assessment of recent injury of anterior talofibular ligament in children. J Ultrason 15:259-266. Xue HP, Liu XW, Tian J, Xie B, Yang C, Zhang H, Zhou DP (2016) Application of computed tomography processed by picture archiving and communication systems in the diagnosis of acute achilles tendon rupture. Biomed Res Int doi: 10.1155/2016/6043638. Yang Q (2011) Three-dimensional finite element analysis of lateral ankle ligament injury and biomechanics of chronic unstable remodeling. Hunan, China: Central South University. GBL conceived and designed the study protocol, wrote the paper, read and approved the final version of the paper for publication, and accomplished this trial aided by other authors. All authors approved the final version of the manuscript for publication.